Private Law in Theory and Practice explores important theoretical issues in tort law, the law of contract and the law of unjust enrichment and relates the theory to judicial decision-making in these areas of private law. Topics covered include the politics and philosophy of tort law reform, the role of good faith in contract law, comparative perspectives on setting aside contracts for mistake and the theory and practice of proprietary remedies in the law of unjust enrichment. Contributors to the book bring a variety of theoretical approaches to bear on the analysis of private law. They include: economic analysis, corrective justice theory, comparative analysis of law, socio-legal inquiry, social history, political theory as well as doctrinal analysis of the law. In all cases the theoretical approaches are applied to recent case law developments in England, Australia and Canada, or, in the case of tort law, proposals in all these jurisdictions to reform the law. 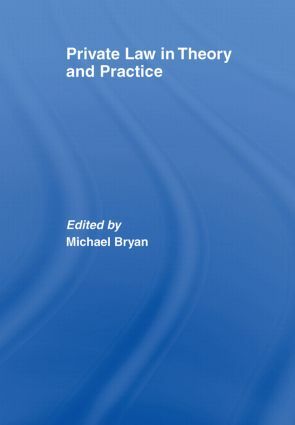 The book presents the theory of private law and the application of theory to practical legal problems in an accessible form to teachers and students of tort, contract and the law of unjust enrichment, legal researchers and law reformers. The standard of good faith performance: reasonable expectations or community standards?